Anyone connected to the Wi-Fi networks of nine MGM Resorts casinos in Las Vegas can now play online versions of slots, bingo and poker using a laptop or mobile device from wherever they're located. For many folks, the thrill of a Vegas casino includes rubbing elbows with gamblers of all kinds at crowded gaming tables in smoky, cavernous rooms during the wee hours of the morning. And, of course, the free booze doesn't hurt. Others, however, simply want to enjoy all by their lonesome the possibility of instantaneous and obscene wealth. If you fall into the latter camp, MGM Resorts International has some wonderful news. Starting this week, guests at any of MGM's nine Las Vegas properties can use their laptops, tablets or mobile phones to play live video poker, slots and bingo, from anywhere in range of the casino Wi-Fi networks. So, for example, if you wake up early and don't want to have to change out of your PJs to play a few hands of classic poker, you can fire up your iPad, log in to MGM's new EasyPlay Mobile Tournaments site, and tempt Lady Luck before you even brush your teeth. If the stuffy gambling hall air conditioning has your head a little foggy, you can take a quick dip in the hot tub and keep the slot wheel spinning with your iPhone. Or if you're simply an antisocial degenerate who'd rather lose all of your hard-earned cash by yourself in the comfort of your own room — I'm not judging … well, maybe a little — MGM is fine with that too. MGM Resorts says EasyPlay Mobile is the "first digital and interactive tournament to be offered by a regulated casino in the United States." 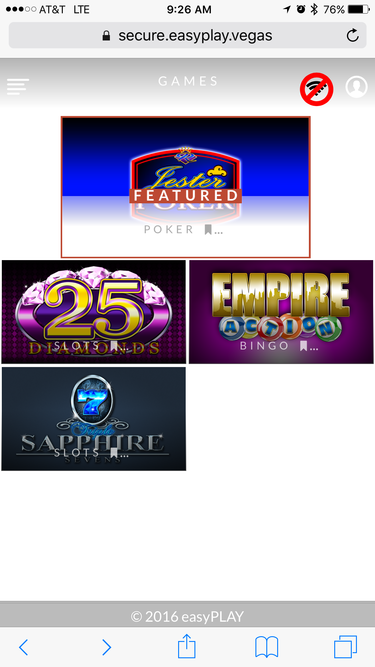 Video gambling games including 25 Diamonds slots, Triple 7 Sapphire slots and Empire Action bingo are now available online for play by customers of 21 years or older at ARIA Resort & Casino, Bellagio, MGM Grand, Mandalay Bay, The Mirage, Monte Carlo, Luxor, New York-New York and Excalibur. You simply create an account, connect a payment card and you're off to the races. However, the potential winnings depend on the amount of people who participate, and there's currently little activity on the site, though it did just launch yesterday. In the past, casino gamblers on a bad run might have walked away from the tables and headed up to their rooms for a cold shower and some downtime. Today, at MGM resorts, they'll still have the cold shower, but today the temptation to drop just a few more dollars is only as far away as their nearest phone, tablet or computer. You can play free versions of MGM's online poker, slots and bingo, and learn more about its new platform, on the EasyPlay website.